Gwendolyn Strong Foundation : Blog : One Final Push! So, here we are. Almost seven full days after embarking on this Chase Community Giving journey together. What started as a whisper behind a unique awareness and fundraising opportunity for this amazing SMA community has roared to life and turned that whisper into a beautifully positive, moving, and humbling grassroots movement. We've all come together and pushed ourselves. We've all done things we never imagined we'd be doing. We've all asked more of ourselves and of others than we ever have before. There have been laughs. There have been tears. There have been goosebumps. There has been constant encouragement, cheerleading, and creativity. And together we have helped change this disease -- no doubt about that. Through our collective efforts on Facebook and Twitter and email and blogs and radio and television and newspapers and good old fashioned word-of-mouth, we've reached millions of people and made them aware of the cruel, terminal reality of this disease called Spinal Muscular Atrophy -- SMA. And, most humbling to us has been that WE'VE done this TOGETHER -- as ONE UNITED FRONT -- fighting to cure SMA and wipe it off the face of the earth forever. 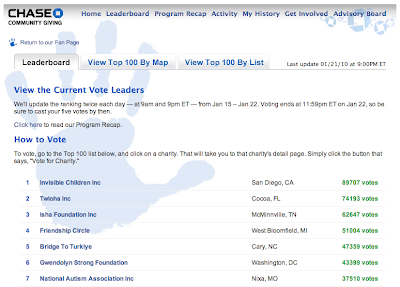 On the eve of the final full day of voting in the Chase Community Giving campaign on Facebook, we stand proudly in 6th place with over 43,000 votes. When we began this campaign last Friday, we knew this was going to be a marathon. But what began as a marathon is now officially a sprint to the finish line when voting ends tomorrow night at 9pm PT/12am ET. Keep in mind that while the #1 spot gets a $1 Million grant from Chase, the #'s 2-6 spots will each be awarded a $100,000 grant. And we believe that placing in the top 6 will bring further awareness opportunities on a broad, national level that SMA has always lacked. There is no doubt a lot at stake tomorrow. We may be fighting a little known disease, but we've proven that we are unmatched in passion...and together we can continue to change its future. We are truly honored to be fighting alongside such an extraordinary group of people.